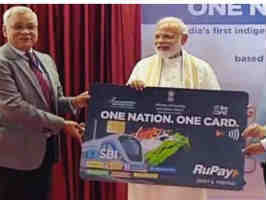 In a bid to promote hassle-free and cashless transportation, India on Monday unveiled ‘One-Nation-One-Card,’ a smart card valid for all modes of public transport in the country. This is an inter-operable transport card would allow the holders to pay for their bus travel, toll taxes, parking charges, retail shopping and even withdraw money. Basically, it is a RuPay card merged with the mobility card that can be used across the country. The customer may use this single card for making payments across all segments including metro, bus, suburban railways, toll, parking, smart city and retail shopping. "The stored value on card supports offline transaction across all travel needs with minimal financial risk to involved stake-holders. The service area feature of this card supports operator specific applications e.g. monthly passes, season tickets etc. The card draws inspiration from existing services connecting transport in Singapore and London. India’s capital, New Delhi, has already been running a pilot project of a common smart card “One Card” connecting city buses and the Delhi metro. It will be powered by RuPay and can be used across all the public transport and retail payments including transit, retail, toll, and parking. In fact, it will let people withdraw money from it. The card will be issued by any bank as debit, credit or prepaid. The “Made in India” RuPay Card is a contactless card and will allow people to tap-and-go. It can be used just like any other debit or credit card. The smart card can either be used to get tickets from the counter or to enter the stations like metro. The smart card also has a “unique stored value” feature that can be used to make digital payments in offline mode. It will also allow the purchase of monthly passes and season tickets. The concept of a single card for all public transportation came from Singapore and London. London’s Oyster card allows travel on any bus, metro or suburban trains. India is reportedly using its own indigenous technology to support the card.